FRED, the modified electric golf carts that provide Free Ride Everywhere Downtown. How many of you enjoy driving around looking for parking in downtown San Diego? I certainly don’t. But what do you do to avoid it? You can take Uber or Lyft or rent an electric scooter. Or, you can take FRED. FRED stands for Free Ride Everywhere Downtown and offers, as the name suggests, free rides within the downtown area, using a mobile app. It is an electric golf cart that can seat up to 5 people and operates on the streets with a 35 mph speed limit. The City of San Diego put FRED in place to solve the last-mile problem in public transportation. To me, FRED is a great example of urban innovation done right by the city with a great promise for the future. The beauty of it is that it offers a much better user experience compared to public transportation and it uses modern technology. Over the last couple of weeks, I educated myself about FRED and want to share what I’ve learned. Over 60 percent of downtown driving is people looking for parking — wasting time and gas. As the city population grows and the parking availability drops, the time people spend looking for parking keeps increasing. Addressing this was the main goal for creating FRED. 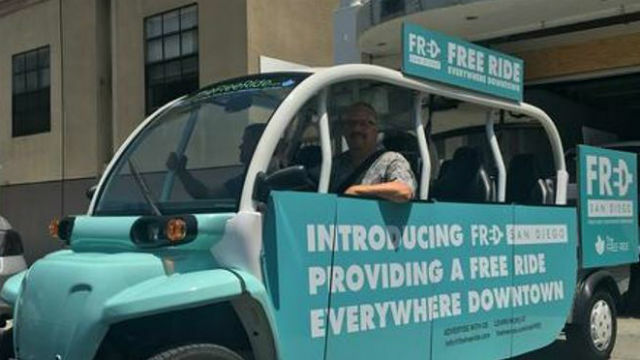 But since its launch, FRED has become much more — a cute way for tourists to get around the downtown area, especially after many downtown hotels started promoting it to their guests. To ensure that FRED is free for everyone, Civic San Diego, a city-owned non-profit that manages the downtown community parking district, funds FRED from downtown parking meter revenues. But FRED does not rely on public funding alone. Today FRED’s total annual operating cost is about $1.2 million, of which only about $760,000 is provided by Civic San Diego. FRED covers the rest of the operating cost through advertising placed on the vehicles. Since its launch in 2016, advertising revenue has been growing rapidly, doubling over the last year from $230,000 in 2017 to $440,000 in 2018. As the advertising revenues continue to grow, FRED’s reliance on public funding will keep going down. San Diego was the first city to implement this model of urban transportation through a public-private partnership. Many other cities now are following suit. While the service is free to the riders, the actual cost per rider is about $5.80, higher than a public bus. It costs about $4,500 a month to operate each of the 22 vehicles in the fleet. In October 2018, there were over 18,000 riders, and as ridership grows, the unit cost will go down. The number of people riding FRED has almost quadrupled over two years and the city is planning to expand FRED to serve uptown and Balboa Park in 2019. In addition, The Free Ride, the company that operates FRED, is working on a ride-pooling option, which should bring the occupancy up and the cost per rider further down. On Yelp FRED gets three stars today, with a majority of five-star reviews, a few one-star comments, and almost nothing in between. With 22 vehicles downtown, an average wait is about 8 minutes, according to Civic San Diego. The wait can be less, but it can also be much longer. It’s obvious that FRED is experiencing some growing pains, nonetheless it’s a great service and a significant improvement compared to a fixed-route bus ride, especially because it’s completely free to the rider. As more FRED vehicles come into operation and the service area grows, so will ridership, which in turn should drive up advertising revenue and further reduce reliance on public dollars. The service should be much better promoted so that more people can take advantage of it. For one thing, putting FRED promotional signs on parking lots can dramatically reduce the stress of parking downtown: park where it’s cheap or free and take a free ride to your destination! What is very important to note is that FRED is innovation driven by our city, putting parking revenues to work and successfully solving the last-mile problem the 21st century way. Daniel Obodovski is co-founder and managing partner of SCALE San Diego, and organization seeking to use the latest technology and public-private partnerships to address urban challenges.